مَغرِز (به معنای بیخ) یا دلتا خرس بزرگ (δ UMa) یک ستاره است که در صورت فلکی خرس بزرگ قرار دارد. نام مغرز به معنی بیخ است که به بیخ و و جای رستنِ دم خرس بزرگ اشاره دارد. این ستاره را در انگلیسی Megrez می‌نامند. در تصور چهار ستاره مربع‌شکل در صورت فلکی خرس بزرگ به عنوان «آبگردان»، مغرز محل اتصال دسته به آبگردان است. یا این‌که جرم مغرز تنها دو برابر بیشتر از جرم خورشید است اما درخشش آن بیش از ۲۰ برابر درخشش خورشید ما است که علت آن فشردگی گرانشی بیشتر در داخل بدنه این ستاره و دمای بیشتر آن است. با این وجود، مغرز کم‌فروغ‌ترین ستاره خرس بزرگ است. فاصله مغرز از زمین ۸۱.۴ سال نوری است و شعاع آن دو برابر خورشید ما است. مغرز کوتوله‌ای است با نور سفید که با دمای ۸۶۳۰ کلوین می‌سوزد و گرمای آن حدود ۵۰ درصد بیشتر از گرمای خورشید ما است. بررسی‌ها نشان داده‌است که عمر مغرز و دیگر ستاره‌های مرکزی آبگردان خرس بزرگ در حدود ۵۰ میلیون سال است و بنابراین آن‌ها در نیمه عمر همجوشی هیدروژنی خود قرار دارند. مشارکت‌کنندگان ویکی‌پدیا. «Delta Ursae Majoris». در دانشنامهٔ ویکی‌پدیای انگلیسی، بازبینی‌شده در ۱۱ دسامبر ۲۰۱۰. ↑ ۱٫۰ ۱٫۱ ۱٫۲ پایگاه stars، بازدید: دسامبر ۲۰۱۰. Megrez, δ Ursae Majoris, δ UMa, Delta UMa, 69 Ursae Majoris, BD+57 1363, CCDM J12155+5702A, FK5 456, GC 16736, HD 106591, HIP 59774, HR 4660, IDS 12105+5735 A, PPM 33469, SAO 28315, WDS J12154+5702A. Delta Ursae Majoris (δ Ursae Majoris, abbreviated Delta UMa, δ UMa), also named Megrez, is a star in the northern circumpolar constellation of Ursa Major. With an apparent magnitude of +3.3, it is the dimmest of the seven stars in the Big Dipper asterism. Parallax measurements yield a distance estimate of 80.5 light-years (24.7 parsecs) from the Sun. Megrez has 63% more mass than the Sun and is about 1.4 times its radius. It has a stellar classification of A3 V, which means it is an A-type main sequence star that is generating energy at its core through the nuclear fusion of hydrogen. It shines at 14 times the luminosity of the Sun, with this energy being emitted from its outer envelope at an effective temperature of 9,480 K. This gives it the white hue typical of an A-type star. This star has an excess emission of infrared radiation, indicating the presence of circumstellar matter. This forms a debris disk around an orbital radius of 16 Astronomical Units from the star. This radius is unusually small for the estimated age of the disk, which may be explained by drag from the Poynting–Robertson effect causing the dust to spiral inward. It has two faint companions, a 10th magnitude star and an 11th magnitude star, both at an angular separation of two arcminutes from the primary. Megrez is a marginally outlying member of the Ursa Major moving group, an association of stars that share a common motion through space and likely formed in the same molecular cloud. The space velocity components of Delta Ursae Majoris in the galactic coordinate system are [U, V, W] = [+15.35, +1.17, –11.52] km s−1. δ Ursae Majoris (Latinised to Delta Ursae Majoris) is the star's Bayer designation. It bore the traditional name Megrez /ˈmɛɡrɛz/ and the historical name Kaffa. Megrez comes from the Arabic: المغرز‎ al-maghriz 'the base [of the bear's tail]'. 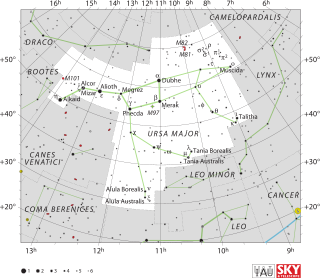 Professor Paul Kunitzch has been unable to find any clues as to the origin of the name Kaffa, which appeared in a 1951 publication, Atlas Coeli (Skalnate Pleso Atlas of the Heavens) by Czech astronomer Antonín Bečvář. The Hindus knew this star as Atri, one of the Seven Rishis. In Chinese, 北斗 (Běi Dǒu), meaning Northern Dipper, refers to an asterism equivalent to the Big Dipper. Consequently, the Chinese name for Delta Ursae Majoris itself is 北斗四 (Běi Dǒu sì, English: the Fourth Star of Northern Dipper) and 天權 (Tiān Quán, English: Star of Celestial Balance). USS Megrez (AK-126) was a United States Navy Crater class cargo ship named after the star. ^ Eggen, Olin J. (August 1998), "The Sirius Supercluster and Missing Mass near the Sun", The Astronomical Journal, 116 (2): 782–788, Bibcode:1998AJ....116..782E, doi:10.1086/300465. ^ Kunitzch, Paul; Smart, Tim (2006) . A Dictionary of Modern Star Names: A Short Guide to 254 Star Names and Their Derivations. Cambridge, Massachusetts: Sky Publishing Corporation. pp. 56, 62. ISBN 978-1-931559-44-7. ^ Allen, R. H. (1963). Star Names: Their Lore and Meaning (Reprint ed.). New York: Dover Publications Inc. p. 438. ISBN 0-486-21079-0. Retrieved 2012-09-04. این صفحه آخرین‌بار در ‏۲۱ سپتامبر ۲۰۱۸ ساعت ‏۱۲:۵۰ ویرایش شده‌است.